RUSH: Jacksonville, Florida. Bobby, great to have you on the EIB Network. Hello. CALLER: Hey, Rush. Good afternoon. RUSH: Great to have you, Bobby. CALLER: (muffled) Thank you. You know, listening to you and the media saying that for eight years they told us that the new norm was like 0.5% or 1% GDP. Unemployment was supposed to go up. Food stamps. More people were on food stamps. For eight years, we heard about it. Now Trump has been in office for one year and the economy is booming. How can they…? I can’t figure out the media. What do they want us to believe? RUSH: What does the media want you to believe? RUSH: The media doesn’t want you to know! The media is trying to hide this booming economy. They think they can by not reporting it. And, despite the fact that people are living it, I wouldn’t be surprised if a bunch of people that watch CNN or MSNBC or read the New York Times… I think those are some of the most closed-minded and narrow-minded and ill-educated people in our country, people who only know what the Drive-By Media tells them. They could be having the greatest economic year of their lives. VARNEY: This is an explosive day. Sit back and watch history. The Dow Jones Industrial Average will hit 26,000. It was only seven trading sessions ago that we hit 25,000. Because it’s the Trump Rally. Anything positive for President Trump — whether it’s the economy or anything — does not get coverage. It is historic, and it is inexplicable that I’m not seeing this on the front page of major newspapers or the top of every newscast or media outlets. But we’re not. They’re ignoring it. RUSH: Totally! By design and on purpose. By not reporting it and ignoring it, they don’t want the people that watch them or read them to know that it’s happening, and they think that they can prevent these people from discovering that there’s an economic boom. Sadly, they may be right, because of the closed-minded, small-minded nature of their audience. But then they do break from it now and again, and they do try to credit Obama as this next sound bite illustrates. This is Christine Romans on CNN this morning talking about the Dow Jones Industrial Average hitting 26,000. ROMANS: A record high for the Dow Jones Industrial Average. This is pretty remarkable, these milestones. It took about two years to get from 18,000 to 19,000 and then there was the election, and since then, look. One after another. The economy is strong. This is almost a nine-year-old bull market. This is an old bull, but it has really been, uh, paying off for investors. So a growing economy, a stock market that’s doing very well here. Um, nine years, really, of expansion and a stock market rally 26,000. I can tell you that since the election, the Dow is up 40%. Since the election, the S&P 500 is up 30%. That is an incredible, incredible return. RUSH: Right. Since “the election.” Not since Donald Trump began implementing economic policy. Not since Donald Trump began deregulating the American economy and stripping a bunch of Obama obstacles out of it. And it’s “a nine-year bull market”? Let me tell you what was going on here, folks. That nine-year bull market is an attempt to credit Obama for this. The stock market was booming during Obama because they were printing money! The federal government… I’m sorry to be shouting here, but this stuff gets me rattled. They were printing money at the Federal Reserve. Quantitative easing is what they were calling it. They were printing money and they were giving it to people that would then invest it and buy securities with it, showing a growing stock market. The truth of the matter is that this is just the beginning of a big, big boom because the last eight years — the eight years of Obama — we were stuck in neutral! In many ways, the economy — the overall economy, not just Wall Street. The overall economy was stagnant or going backwards. Unemployment was said to be coming down, but the labor force participation rate was getting smaller. More and more people went out of the workplace, and they were telling us that America’s best days were behind us. They were telling us that this the new era of decline, and that Obama and the Democrats were the masters managing the decline, to make it fair and equitable for everybody. It was Obama traveling to states like Indiana, telling them (impression), “Don’t think those jobs that you’ve lost are coming back. Trump says they’re gonna come back. “What’s he gonna do? Wave a magic wand? That’s not how it works. That’s not who we are.” So for eight years there was pent-up — and I’ll tell you something else that was going on. There was abject fear of the race of Barack Obama. So you had people sidling up — crony capitalism, what have you — trying to stay close to Obama for fear of what damage he could do if he became an enemy. The market was stagnating. Obama is gone, and we have entered a brand-new era of growth that is resulting from what I think is eight years of pent-up stagnation and frustration. I think people for eight years were really afraid to seriously invest. Why would they? The president was telling everybody that our best days were over! The president was telling everybody that America’s economic success in the past was maybe undeserved for a host of reasons! We had stolen resources from other nations in the world. We had been unfair to certain people. Corporations were unfairly wealthy while everybody else was getting poor. Whatever they said. They were talking down the U.S. economy while at the same time bragging about employment, jobs programs, any number of things. But what is happening now? She’s right, even though she hated to admit it. The pronounced economic uptick in activity since the election is almost unprecedented, and I’m telling you that I believe it’s the result of eight years of pent-up frustration and fear. Whatever we had going on in the last eight years, it was not an atmosphere conducive to investment and business overall. If you’re an Obama-selected business like Google, various outfits in Silicon Valley, General Electric, then, yeah. Everything was great. But if you were on the enemies list — if you happened to be a Walmart or if you happened to be Big Pharma, if you happened to be Big Oil — I guarantee you, you were in that administration’s crosshairs. Look at what fracking alone has meant! Getting rid of the restrictions on drilling horizontally for oil? Look at what has happened in our energy sector — exactly as Trump forecast and predicted that he would accomplish — making us, the United States, an energy leader. Now all these pipelines have been approved and open. None of them got approved during Obama’s administration because of the fear there could be great damage to climate change if there were any leaks or spills as we know they happen with pipelines, blah, blah, blah, blah. People are trying to say another thing, that this year is kind of an outlier, that this is phony. You know, it’s built on balsa wood, it’s a very, very fragile foundation, and the bottom could drop out of this economy at any moment. The bottom could drop out of the stock market at any moment because of course this isn’t really real. ‘Cause it’s too good to be real. It’s happening when the Democrats are not in power. It can’t be real. And I think it’s the exact opposite. I think this is the beginning of a boom. I said this last week. I said this last month. I think the economy is just now beginning to kick in, and in February when these tax cuts actually begin to happen, you couple the bonuses people are getting with the fact that 85% of the American people are gonna have more take-home pay every paycheck, so the bonuses are large enough they’re gonna keep a lot more of it than they otherwise would. The Washington Free Beacon put together a great two-and-a-half-minute video of every Drive-By analyst you can think of saying the tax cuts wouldn’t work, juxtaposed with yet another example of an American business bonusing, raising, expanding benefits. We’ll take a break and I’ll get to it after the break, but here’s just one bit of evidence. 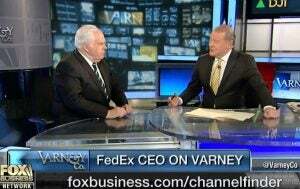 Fred Smith, who was the founder, creator of FedEx, he was on Fox Business Network today. FedEx is a $65 billion company. FedEx, 13 million shipments per day. They have an airline of 650 airplanes. They don’t move people. They move cargo. FedEx has 5,000 facilities and 150,000 vehicles and a half million employees in 220 countries. And Fred Smith, the founder, CEO of FedEx, said the necessary thing for them to grow, to take the risk out of expanding, is this new tax policy. This new tax policy, the corporate tax rate reduction, is the key to take the risk out of expanding. He said to expect some announcements from FedEx next week on what they’re planning for the tax cuts. But they didn’t feel like making the investment for more airplanes, giving more routes, more vans to deliver. And that’s what Fred Smith is saying now. Now with this massive tax rate reduction, they are gonna probably institute a whole lot of expansionist plans and bonuses to the employees. But we’re over a hundred companies and they’re all using money from what would otherwise be sent to Washington via taxes. They are not taking money from the profit line to pay these bonuses. RUSH: Let’s go to the top here, audio sound bite number 1. We got time to squeeze one of these things in. What happened was that the people at the Washington Free Beacon put together a montage. Of course, these montage ideas began right here on the EIB Network and on Rush the TV Show. And they are very effective. The Washington Free Beacon posted a montage, media: Wages will not increase because of tax reform. This is what the media was lying to everybody about how the tax reform bill would not amount to anything for you because it was only for corporations and it was impossible for people to benefit when corporations got a tax cut. It’s a two and a half minute bite, but I knew I’d not have two and a half minutes solid to go through it so Cookie cut it into three segments for me. Here’s the first one, 37 seconds. We’re gonna have Katy Tur, NBC, Andrew Ross Sorkin from wherever, Ali Velshi, who may be one of the biggest ignoramuses on economics or anything else in the media, he’s at MSNBC, used to be at CNN. He looks like Mr. Clean with classes. We’ve got Stephanie Ruhle and others. Here’s just a sample of what this sounds like. KATY TUR: It feels like you’re relying on this tax cut of the corporations, of the wealthy, to trickle down. ANDREW ROSS SORKIN: Yeah, Southwest and American Airlines both announcing they’re gonna give a thousand dollar bonuses to employees following the tax overhaul. KEITH BOYKIN: Wage increases don’t follow tax cuts like this. CNBC REPORTER: So the world’s largest retailer giving its U.S. employees a bonus, a wage increase, and expanded maternity and parental leave. STEPHANIE RUHLE: So you’re creating a huge tax cut. STEPHANIE RUHLE: And you might not get wage growth. CNBC REPORTER: Capital One Financial, which just confirmed to CNBC that they will raise the minimum wage for all U.S.-based employees at Capital One to $15 per hour. RUSH: Despite what these experts in the media are saying, this is impossible, it never happens! We have time for one more example. Remember, we have a two and a half minute bite. This is the second segment. This runs a little shy of a minute. RUSH: Stop the tape, stop the tape, cue it be back. Stop the tape, please. Cue it back. This is Steve Schmidt, the guy who ran the McCain campaign, the first guy you hear here, Steve Schmidt, the guy who ran the McCain campaign. That should tell you something. STEVE SCHMIDT: And anybody who thinks that this corporate tax cut is going to trickle down to lift wages has a staggering ignorance of how public companies function. CNBC UNIDENTIFIED REPORTER: Wells Fargo said it would raise its minimum wage to $15 per hour. BRUCE BARTLETT: But the day we cut the corporate tax rate, you know, wages are gonna suddenly jump up, when there’s absolutely no historical evidence whatsoever that this will happen. CNBC UNIDENTIFIED REPORTER: Boeing announced $300 million in investments for corporate giving and workplace improvements. SAVANNAH GUTHRIE: I’ll ask you plainly: Are you living in a fantasy world? YLAN MUI: AT&T announced that it will invest a billion dollars in the U.S. in 2018. Also, for 200,000 workers, it will provide them a $1,000 bonus. ALI VELSHI: That is — how do I say this nicely? — absolute nonsense. There are no examples anywhere of companies distributing their tax savings to their workers. CNBC UNIDENTIFIED REPORTER: Sinclair Broadcasting and Kansas City Southern are among others committing to bonuses. RUSH: That last guy was Ali Velshi. “There’s no examples anywhere of companies distributing tax savings to their workers.” Bruce Bartlett, former conservative, don’t know what happened to him, “The day we cut the corporate tax rate, wages are gonna suddenly jump up when there’s absolutely no historical evidence whatsoever it will happen”? It’s right in front of your face, Bruce, and Ali, and all the rest of you. RUSH: I have the third installment of the Washington Free Beacon video that juxtaposes all of these media people saying, “A corporate tax cut never leads to people/employees benefiting. It never happens!” We have one more… It’s sound bite number 3, and it leads off with our old buddy Ali Velshi. It features Fredo Cuomo and Pelosi. Here it is. Sound bite number 3. Three, two, one. VELSHI: Generally speaking, when companies get tax cuts, they keep them for themselves and distribute them to the shareholders. CNBC REPORTER: BBNT pledging to give out bonuses of $1200 for almost 75% of its workforce. CUOMO: Who says that giving corporations more money will make them raise wages? CNBC REPORTER: It’s also raising its minimum wage from $12 to $15 an hour. SELLERS: Will they actually increase wages? Will employees actually see the benefits of a corporate tax cut? None of them will raise a hand, because that’s simply is not true. CNBC REPORTER: Bank of America say they’re willing to shell $1,000 bonuses to nearly 150,000 of its employees. RUHLE: This is a clear cut for the top, and it’s a hope and a wish for anyone else. CNBC REPORTER: Its CEO announced the company would award special $1,000 bonuses to more than 100,000 eligible frontline and nonexecutive employees. RUSH: That’s Pelosi. I want you to go back and grab number 2 because number two has some of the biggest names in it. The sound bite number 2 begins with Steve Schmidt. This is the guy that ran the McCain campaign and is now on MSNBC all the time, just basically openly critical of mainstream conservatives and conservatism. Then we have Bruce Bartlett, who used to be a conservative in the Reagan White House, I think he was, but something happened to Bruce. I used to communicate with Bruce now and then by email, but we lost Bruce, or Bruce took himself off the reservation. So he’s the second bite on this. And then there’s Savannah Guthrie. She was talking to Paul Ryan when she said (paraphrasing), “Are you living in some kind of fantasy world where you think these tax cuts are gonna give people more money?” And then there is Ali Velshi again at the end. So this bite has more of the big names. Again, Steve Schmidt starts it, Bruce Bartlett in the middle there, and then Ali Velshi. RUSH: Now, that last bit there is Ali Velshi. And, folks, specifically these bonuses and wage increases are coming from money that would otherwise be spent as tax money to Washington. Ali Velshi is 1,000% wrong. “Absolute nonsense, no examples anywhere of companies distributing their tax savings to their workers.” These people are all leftists, and they all have been trained their whole lives to think corporations are evil, that they kill their customers, they make their customers sick, they don’t treat their employees well, they basically pay them slave wages, they’re just basically a bunch of rotgut meanies and we shouldn’t let them contribute to campaigns, either. You couldn’t have people be more wrong, more brazenly, more openly, more proudly wrong than these experts. And before we even got to this point, these same people and all the others in the Drive-By Media were trying to kill the tax cut from passing by telling people that it was not gonna benefit them, that they were gonna pay more, that it was a trick, it was a corporate tax rate but you’re gonna pay through the nose. And the Drive-Bys dutifully reported that. So what are the Democrats gonna do now that real life is interceding here? People are getting wage increases, they are being bonused, their benefit packages are increasing. That starts next month as the withholding will reflect the tax cut. So real life versus what they read in the New York Times and see on CNN where the tax cut didn’t happen, it’s not helping you. I predict what’s gonna happen is that all the New York Times readers are gonna believe that the economy is not rebounding. They’re gonna believe the tax cut isn’t working, despite getting one themselves. They’ll say, “Wow, I’m really lucky it’s working for me, but according to the New York Times everybody’s in a world of hurt out there.” And that’s how they’ll do it. The people that read, watch the Drive-By Media believe it. Just like the Drive-By propagandists report it, they believe it. So with all this economic growth going on, the Democrats are gonna run on Trump hatred and what else?